You can now deposit checks and have instant access to your money with our mobile app and Remote Deposit Capture. Remote Deposit Capture (RDC) eligibility requires membership and enrollment in eBanking for 90 days. After you've been signed up for eBanking for 90 days, you'll automatically be able to use RDC. 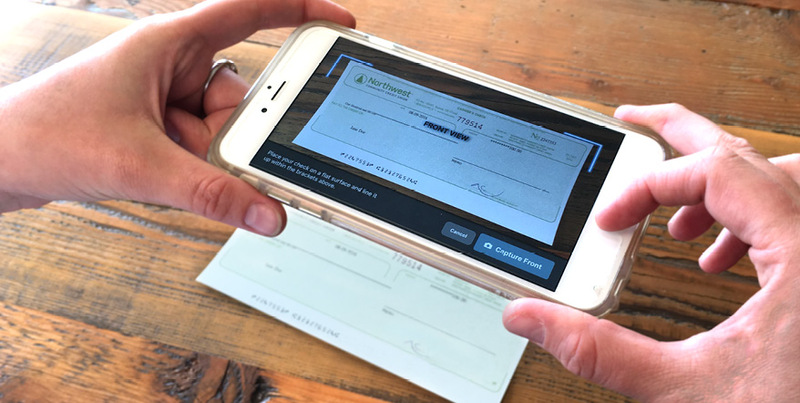 To deposit your check using your smartphone, it's easiest to use our mobile app (available on both Apple and Android operating systems). You'll deposit your check through this app. Make sure your check is endorsed. If you're not the only one the check is made out to, make sure everyone has signed it--otherwise, your check could be rejected. On the same side as the endorsement, write "For mobile deposit only to NWCU" below your signature. This ensures faster processing. In the left-hand menu, select Transactions and choose Deposit Check. Follow the on-screen prompts. Make sure the image is clear to ensure it's processed successfully. That means the routing and account numbers are clearly visible and there's some space between the check and the edge of the image. Beginning in early July 2018, you'll receive email receipts after depositing your check. Please do not respond to the emails, as they contain receipt information only. After depositing, you will receive an automated email receipt. Keep the check for at least 30 days, just in case any further processing is necessary. You'll receive another automated email receipt once the check has been processed that lets you know whether your check has been approved, adjusted, or rejected. You can deposit as many checks as you'd like; each check is one transaction. Funds will be available immediately. There is a weekly limit of $5,000 total in checks, so if you try to deposit more than $5,000, you'll receive a message that says, "Business day amount limit exceeded."